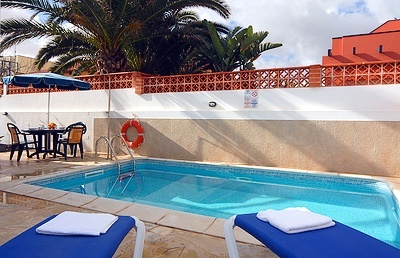 Villa Irini is a three bedroom villa situated in the resort of Corralejo in Fuerteventura. It is only one line back from the sea and is in walking distance of both the dune beaches and the resort centre with its restaurants and shops. The sun terrace is very private as it is surrounded by high walls. There is a heated swimming pool, for guests sole use, as well as sun loungers, a patio table and chairs and a sun umbrella. There is also a roof terrace which enjoys stunning sea views. The open plan living room has patio doors which lead out to the front terrace. A nice touch for this villa is that all windows have tinted glass, which keeps the interiors cool in this hot climate. Two of the three bedrooms have double beds and the other has bunk beds and all have fitted wardrobes. There is a family bathroom and separate shower room.